This event is open to existing Qlik customers and prospects, and it will be the must attend Qlik event of the year. The event is free to attend by registering below, and all registrations will go through a checking and approvals process before reservations are confirmed. Take the opportunity to speak to senior Qlik experts from Differentia Consulting and senior members of Qlik. They will be happy to demonstrate the benefits of Qlik to you, and talk to you about your current or potential Qlik deployment. This event will demonstrate how Qlik can be used as a complete platform for discovery. Giving all of your workforce the power to make discoveries, enabling business transformation. We are very pleased to have two Industry Director’s from Qlik presenting at the event; Paul Winsor and Sean Price and also two customer presentations. Strategic lead for BI industry solutions across EMEA Public Sector & Healthcare formerly worked at Avon and Somerset Police where he was an innovative and successful senior leader in a large and complex organisation. Achievements include; Chief Constable Commendation; National and European innovation awards for predictive analytics; nationally recognised enterprise Qlik Sense roll out; introducing and innovating with IBM Watson Cognitive Computing. National work includes; advising the HMIC Technical Advisory Board; regular high-profile presentations/key note speaking and authoring. Today my responsibilities are to execute the Retail, Manufacturing and Life Science industries segment by engaging in consultative sales support with customers, prospects, partners and sales field across enterprise accounts, mid-market, and other strategic opportunities. Build brand awareness and recognition through industry segment specific Analyst, Media, and industry/customer engagement. Contribute to the Qlik industry segment go-to-market strategy and business plan, define key solutions and positioning of Qlik products, create and develop suite of segment specific sales enablement materials. Acquisition of CrunchData and the Crunch Bot. Full Qlik Sense Enterprise SaaS capabilities on the horizon as part of the multi cloud journey! 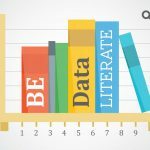 Qlik is raising awareness about the lack of Data Literacy in the world, specifically the USA and invite you to have a free data literacy check. If you would like to be kept informed about Differentia Consulting News and Events then please sign up to our newsletter at the end of the page. Thank you.